Malaysia covers a total area of 329,847 km² with a population of 31.6 million people in 2016. 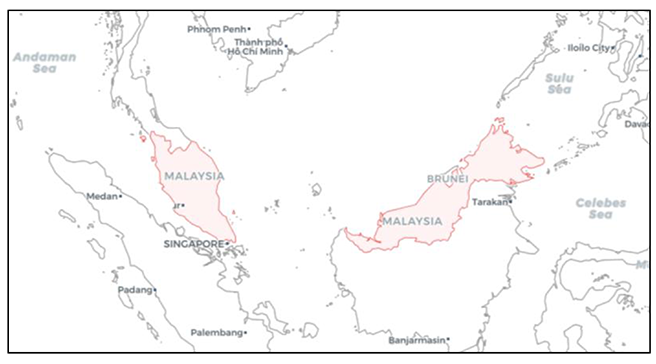 The country consists of two geographical regions divided by the South China Sea, the Peninsular Malaysia (West Malaysia) on the Malay Peninsula bordered by Thailand on the north and Singapore in the south, and Malaysian Borneo (East Malaysia) located on the northern part of the island of Borneo in the South China Sea, bordering Indonesia and surrounding Brunei Darussalam. 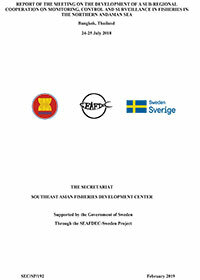 The country shares maritime borders with the Philippines and Viet Nam (Figure 1). In 2015, the fisheries sector in Malaysia has provided employment to 175,980 people and its contribution to national GDP was at 1.1%. 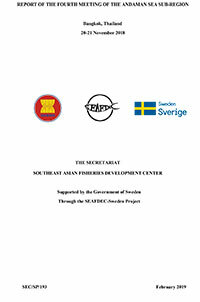 Food fish production is at 2.0 million MT/year valued at US$ 3.3 billion. Fish trade is valued at US$ 1.7 billion, and the estimated average consumption of fish is 56.8 kg/person/year. Marine capture fisheries is the main contributor to fish production and economy of Malaysia in 2016 at 1,574,447 MT valued at US$ 2.5 million and providing work to 132,305 people. Aquaculture followed at 407,387.31 MT valued at US$ 0.68 million providing livelihood to 21,790 people and inland capture fisheries at 5,847.97 MT valued at US$ 0.02 million (Figure 2). Marine capture fisheries is managed and regulated by the Department of Fisheries (DOF) Malaysia under Fisheries Act 1985. Under this act, fishing without licence is an offence and can be prosecuted. The DOF had implemented in 1982 the four-zone marine protected areas (MPAs) denoted as A zone (0-5 nm), B zone (5-12 nm), C zone (12-30 nm) and D zone (beyond 30 nm) as shown in Figure 3 (left). 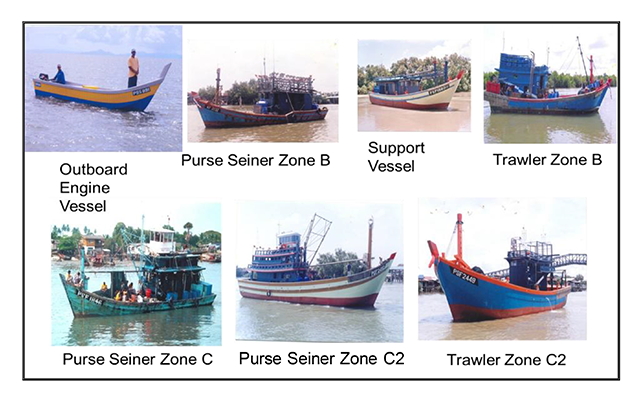 In 2014, a new zoning system (Figure 3, right) was introduced to reduce the number of trawlers and their encroachment activities in the traditional fishing areas and to enhance the protection of coastal areas to protect juvenile fishes. The new zoning systems were applied only in some States such as Perak, Selangor, Penang, Perlis, and Kedah. On the contrary, other States retained the old system and some fishing communities protested especially the trawlers as they perceived that the government is giving too much privilege to the artisanal fishermen. Figure 4 shows the different types fishing vessels in Malaysia. In 2016, 42% of total number of fishermen is artisanal using fishing vessels with outboard engine or no engine and there were 53,190 licensed fishing vessels. 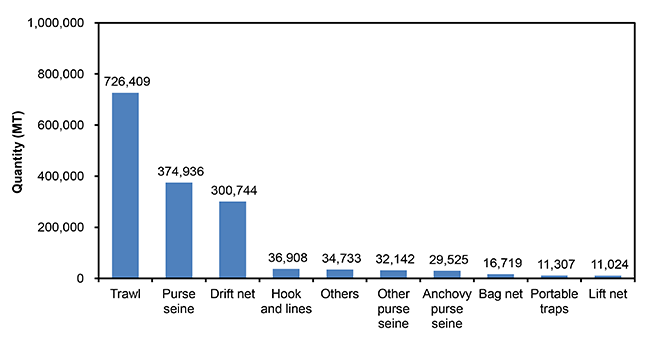 The main fishing gears used in marine capture fisheries were trawl and purse seine (Figure 5) which produce up to 70% of marine fish landings. Management of inland capture fisheries is covered by State laws and currently each State has its own set of regulations. Most of the States have their respective mandated DOF to enforce its laws. There are however issues that tend to impede the development of the country’s inland capture fisheries. These include the use of illegal fishing techniques, release of alien species in natural waters, and habitat degradation. Stocking and releasing indigenous species into the river are done continuously and have received well responses from the public. 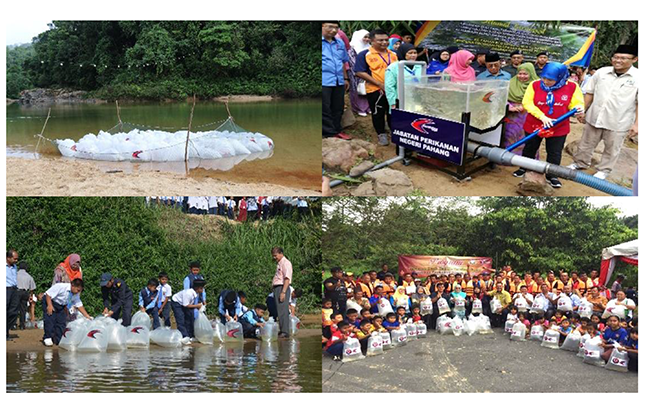 The release of fish fry/fingerlings has also become an important tool to raise awareness among the public about fish conservation (Figure 6). 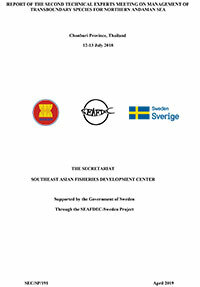 Establishment of fish sanctuary are also encouraged and supported by DOF (Figure 7). 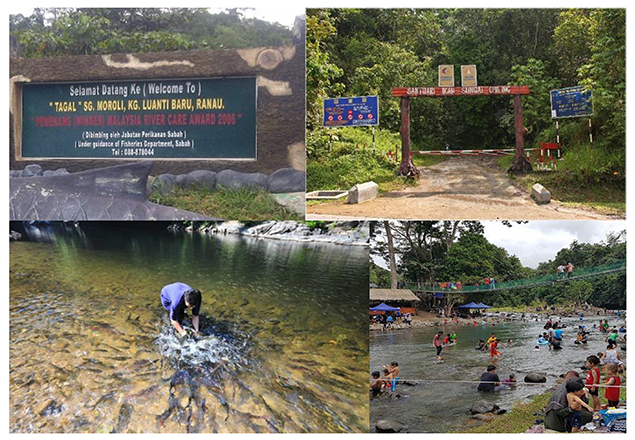 In Malaysia, aquaculture is being carried out in earthen ponds, floating sea and river cages, and tanks (Table 1). Under the National Agriculture Policy 2011-2020, aquaculture has been recognized as a new growth area and is a high priority by the Malaysian Government. 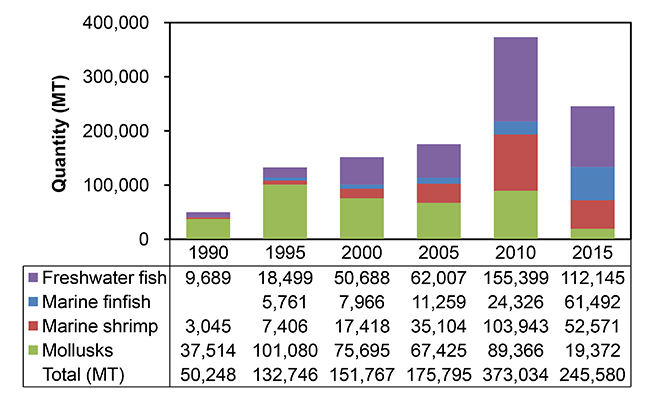 Figure 8 shows the aquaculture production of Malaysia in 1990-2015. Aquaculture production in Malaysia, once driven by the export market, have been impacted by a few setbacks such as withdrawal of fishery products from the European Union (EU) market in 2008, loss of culture areas to other developments, and increase in production costs. One of the most impacted aquaculture commodities to non-tariff trade barrier are the ornamental fishes that led many fish farmers to convert their land to food fish production or other developments. 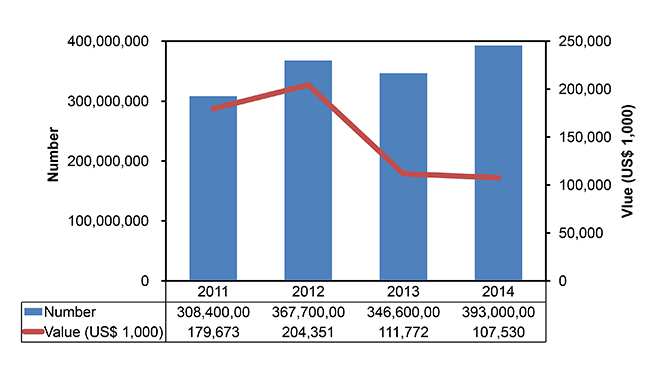 The production of ornamental fishes in Malaysia in 2011-2014 is shown in Figure 9. 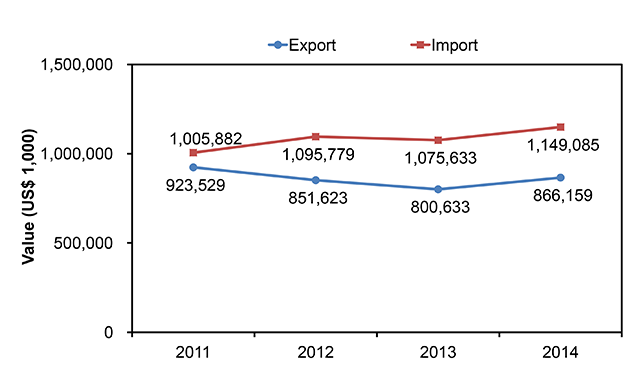 In 2014, Malaysia exported fish and fishery products worth US$ 0.87 billion. The main export commodities were shrimps (US$ 304.54 million), squid (US$ 72.80 million), live fish (US$ 37.04 million), and ornamental fishes (US$ 19.82 million). 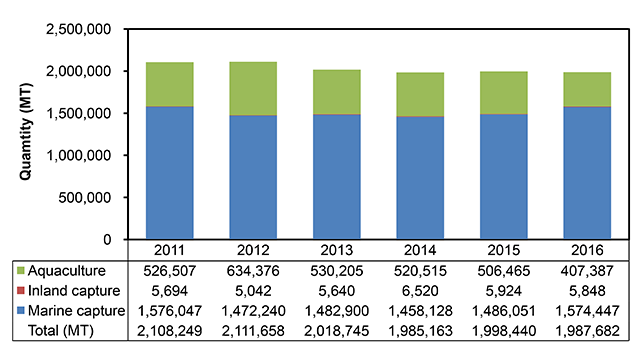 In 2014, Malaysia imported US$ 1.15 billion worth of fish as food (Figure 10). 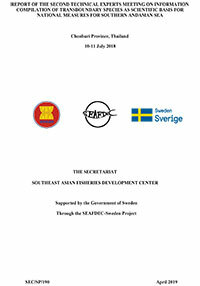 All fishing activities in Malaysian waters need to have valid license issued by the DOF. All policies and procedures pertaining to the licensing are based on Fisheries Act 1985 (Part IV) and Vessel Registration Policy and Procedure Handbook. Licenses issued are subject to availability of resources, categories of vessels, and profile of ownership. Other than the Fisheries Act 1985, there are some related acts that are used to regulate fishing activities such as Exclusive Economic Zone Act 1984, Merchant Shipping Ordinance 1952, Malaysian Maritime Enforcement Act 2004, Police Act 1967, Customs Act 1967, Immigration Act 1963, Malaysian Quarantine and Inspection Services Act 2011, and International Trade in Endangered Species Act 2008. To ensure sustainable fisheries development in Malaysia, policies have been developed through scientific research and collaboratian with regional and international related bodies. Main policies are National Agro-Food Policy 2011-2020, Strategic Plan of Department of Fisheries Malaysia 2011-2020, Capture Fisheries Strategic Plan Malaysia 2015-2020, and Malaysia’s National Plan of Action to Prevent, Deter and Eliminate IUU (NPOA-IUU) fishing. FAOSTAT. 2018. Statistics Division, Food and Agriculture Organization of the United Nations. 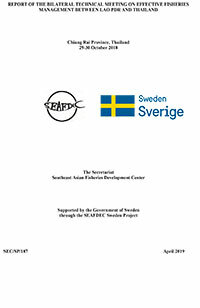 Available at http://www.fao.org/faostat/en/#country/131. Accessed on 28 May 2018.